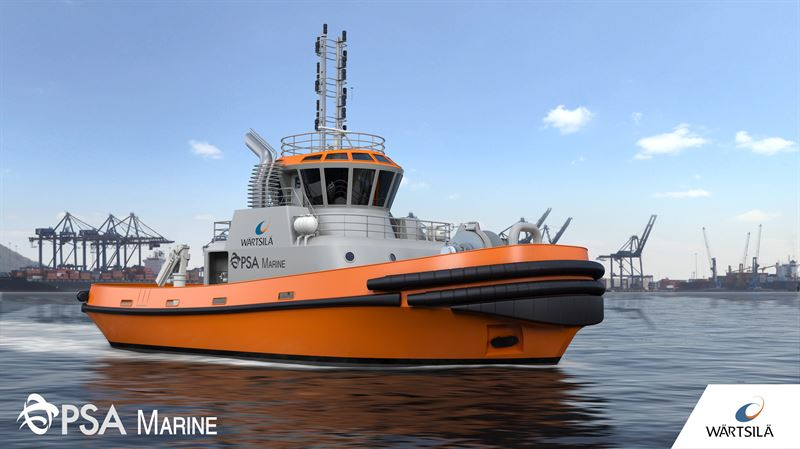 Wärtsilä said it has been contracted to design and equip one of PSA Marine (Pte) Ltd's newest harbor tugs. Operating on liquefied natural gas (LNG) fuel and incorporating fuel efficiency features, the harbor tug, which will be built by PaxOcean Shipyard, will be aligned with the maritime industry’s increasing emphasis on environmental impact. The order with Wärtsilä, booked in March 2018. The 28-meter long, 50-metric-ton bollard pull harbor tug will operate with two Wärtsilä 20DF dual-fuel engines running primarily on LNG fuel. Wärtsilä will also supply its LNGPac fuel storage and supply system as well as steerable thrusters and the Wärtsilä ProTouch control system. The equipment will be delivered to the yard at the end of 2018 and the harbor tug is slated to commence operations in the port of Singapore around mid-2019. “We are honored to have been selected to provide both the ship design and an integrated propulsion solution for this modern, efficient and environmentally sustainable harbor tug. Being the one-stop-shop for this vessel, from the design to the engineering and machinery supply, Wärtsilä can ensure a fully integrated and optimized harbor tug. This not only supports the entire project, but also eases the procurement and supplier interfacing processes for the shipyard,” commented Riku-Pekka Hägg, Vice President of Ship Design, Wärtsilä Marine Solutions.